This card's ATK and DEF is the reversed ATK/DEF of Kaien the Emissary of Darkness, which is also where the Japanese name of the Token this card produces, Kaien the Emissary of Darkness Token, is derived from. This monster bears a resemblance to the Bakugan character Masquerade, except having a darker color scheme. Both characters also have some relationship with a type of underworld. This card's original name is Gorz the Emissary of Hades, while Masquerade has sent Bakugan to the Doom Dimension, which he referred to as The afterlife for Bakugan. The token summoned by this card's effect is named Kaien the Emissary of Darkness. She is a LIGHT Fairy-type Monster, in direct contrast to the DARK Fiend Gorz. Coincidentally, Masquerade was later revealed in the anime to be the alter-ego of Alice Gehabich, another Bakugan character. Masquerade is known for being merciless and cruel, while Alice is kind and polite. This is the only promo card to date which does not have the golden hologram in the corner. The Summoning of a LIGHT Fairy-Type Token by the effect of a DARK Fiend-type monster is reminiscent of the Chaos theme. This monster appears in the artwork of Stairway to the Underworld. 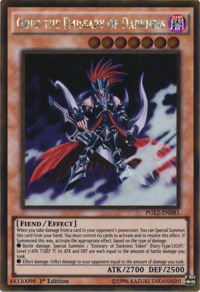 This card is featured on the OCG cover of Duelist Pack: Yugi. The Ghost/Gold Rare version of this card's artwork changes colors, unlike most other Ghost Rare cards. This is the only known non-Forbidden card which has the potential to create a Zero Turn Kill without relying on an alternate win condition. Both "Solemn Warning" and "Solemn Judgment" are Counter Trap Cards so they can be activated in the Damage Step. "Solemn Warning" can be activated to negate the Special Summon of "Gorz the Emissary of Darkness". "Solemn Judgment" cannot be activated to negate the Special Summon of "Gorz the Emissary of Darkness". "Solemn Judgment" cannot negate monster effects. "Gorz the Emissary of Darkness" is being Special Summoned by a monster effect. "Solemn Warning" does not have such a restriction as its effect includes the ability to negate monster effects as well. : solemn warning/judgement, or War Chariot vs Gorz. If you control 1 monster and it is destroyed by "Ring of Destruction", you can activate the effect of "Gorz the Emissary of Darkness". : When you take damage from "Ring of Destruction", can you activate the effect which Special Summons "Gorz the Emissary of Darkness"? If you have two or more "Gorz the Emissary of Darkness" in your hand when you receive damage, you can only activate the effect of one of them. : If you have multiple "Gorz the Emissary of Darkness", when you take damage, can you Special Summon multiple copies? Tragoedia: If you have both "Tragoedia" and "Gorz the Emissary of Darkness" in your hand, you cannot Special Summon both when you receive a direct attack. You can only activate one. : When "Gorz the Emissary of Darkness" and "Tragoedia" are in your hand, when you receive Battle Damage, can both be activated as a chain? If you take damage in the middle of a chain, then you cannot activate the effect of "Gorz the Emissary of Darkness". Its effect cannot interrupt the resolution of a chain, and after the chain resolves, you have missed the timing to activate the effect. : When you take Effect Damage at Chain Link 2 or higher, can "Gorz the Emissary of Darkness" be Special Summoned? Against the Wind: The "inflict damage" and "add the monster to your hand" effects of "Against the WindFor example you can activate the effect of "Gorz the Emissary of Darkness" when you take damage from "Against the Wind". : Are the "damage" and "add to your hand" effects of "Against the Wind" considered to resolve simultaneously?The example with "Gorz the Emissary of Darkness" is invalid since "Gorz the Emissary of Darkness" can only activate its effect when its controller receives effect damage by "an opponent's effect", and "Against the Wind" can only inflict damage to its controller, not to its opponent. Evil Thorn: For the effect of "Evil Thorn", "inflict 300 damage" and "Special Summon two "Evil Thorn" in face-up Attack Position" are considered to resolve simultaneously. After the effect resolves, your opponent can Special Summon "Gorz the Emissary of Darkness"add to your hand" effects considered to resolve simultaneously? When you take battle damage from "Spirit Reaper"/"Don Zaloog"/"Airknight Parshath"/etc, you can chain "Gorz the Emissary of Darkness"s effect. He will Special Summon himself, and then you resolve the other effect. : When "Spirit Reaper" deals Battle Damage, can "Gorz the Emissary of Darkness" be chained and Special Summon itself? Fake Explosion: When you activate "Fake Explosion" in response to a direct attack, after Damage Calculation you can activate the effect of "Gorz the Emissary of Darkness" in Chain to the effect of "Fake Explosion" which Special Summons "Summon Reactor・SK". : Can "Gorz the Emissary of Darkness" be Special Summoned in chain to the effect of "Fake Explosion"? Black Horn of Heaven: The effects of "Thunder King Rai-Oh", "Black Horn of Heaven", "Solemn Judgment", and similar cards cannot negate a Special Summon which occurs during the resolution of an effect which "activates". : Please explain what Special Summons can and cannot be negated by the effects of "Thunder King Rai-Oh", "Solemn Judgment", and so on. Example: When Battle Damage is inflicted, the effect of "Gorz the Emissary of Darkness" which Special Summons it "activates". Thus, you cannot negate this with the effect of "Thunder King Rai-Oh". Light and Darkness Dragon: "Light and Darkness Dragon" will also negate the effect of a monster which activates in the hand. The monster will not be sent to the Graveyard. : Can the effect of "Light and Darkness Dragon" negate the effect of a monster like "Gorz the Emissary of Darkness" which activates in the hand? If the effect of "Gorz the Emissary of Darkness" is negated, then its effect to Special Summon itself cannot be activated again, unless you are receiving Damage for a second time. The Fabled Unicore: The effect of "The Fabled Unicore" which negates the activation of a monster's effect and destroys the monster will also negate the effect of "Gorz the Emissary of Darkness" which activates in the hand, so that the effect is negated and the "Gorz the Emissary of Darkness" in the hand is destroyed. : Can the effect of "The Fabled Unicore" negate the effect of a card which activates in a place other than on the field? Thunder King Rai-Oh: "See above; listed under "Black Horn of Heaven"." The Original ATK and DEF of the "Emissary of Darkness Token" Special Summon by "Gorz the Emissary of Darkness" is "? ", so it will be treated as "0" when interacting with "Shrink" and "Megamorph". Both will make the ATK of the "Emissary of Darkness Token" become 0. When the effect of "Shrink" is no longer applied, the "Emissary of Darkness Token" will have 0 ATK. When the effect of "Megamorph" is no longer applied, the ATK of "Emissary of Darkness Token" will return to what it was when "Emissary of Darkness Token" was Summoned. : When "Megamorph" and "Shrink" are activated and target "Emissary of Darkness Token", how does its ATK change? The Original ATK and DEF of the "Emissary of Darkness Token" are treated as ?/? (thus 0/0 while it is face-up on the field), as stated in the text of "Gorz the Emissary of Darkness". When "Megamorph" is equipped to the "Emissary of Darkness Token", it will have 0 ATK. : What is the Original ATK and DEF of a Token Monster? Example: If a "Emissary of Darkness Token" (? ATK / ? DEF) from "Gorz the Emissary of Darkness" is Tributed for "The Tyrant Neptune", then the ATK and DEF of "The Tyrant Neptune" do not increase. Calming Magic: After the effect of "Calming Magic" has resolved, players cannot Special Summon monsters and cannot choose to activate effects which Special Summon monsters. : Please explain whether or not a player can activate an effect which Special Summons a monster while the effect of "Calming Magic" is being applied. If the effect that inflicts damage to your Life Points is Chain Link 2 or higher, you cannot activate "Gorz the Emissary of Darkness" effect. If your opponent activates an effect that destroys the only card on your side of the field and also inflicts damage to your Life Points, you can activate "Gorz the Emissary of Darkness" effect. If the destroyed card has an effect that activates at this time, you can still activate the effect of "Gorz the Emissary of Darkness". The effect of the destroyed card and the effect of "Gorz the Emissary of Darkness" will form a Chain. If your opponent inflicts battle damage to your Life Points with a monster like "Airknight Parshath" or "Spirit Reaper", you can activate the effect of "Gorz the Emissary of Darkness". The effect of your opponent's "Airknight Parshath" or "Spirit Reaper" will be Chain Link 1 and the effect of your "Gorz the Emissary of Darkness" will be Chain Link 2. If you activate "Mystical Space Typhoon" and your opponent chains "Judgment of Anubis", if they destroy the only monster you control with its effect and inflict damage to your Life Points, you can start a new Chain by activating the effect of "Gorz the Emissary of Darkness" if you don't control any cards. If you inflict damage to your opponent's Life Points with a card effect and your opponent Special Summons "Gorz the Emissary of Darkness", when the damage inflicting effect of your opponent's "Gorz the Emissary of Darkness" activates, you can chain the effect of "Cyber Dinosaur". If you select an "Emissary of Darkness Token" with "Shrink", its ATK becomes 0.